No one would argue the Canadian Navy has had an easy time of it with its four Upholder-class diesel-electric submarines. Each one has been plagued with problems since they were acquired from the British Royal Navy a decade ago. Here’s a nice video of one of them, HMCS CORNER BROOK (ex-HMS URSULA) underway in early June 2011. One of three submarines based on the west coast at Esquimalt, British Columbia, the CORNER BROOK had just transferred from the east coast when this video was shot. Sadly, the cheerfulness shown in the video didn’t last long. The submarine struck bottom while operating submerged near Vancouver Island in Nootka Sound on June 4, 2011. Despite injuries to two sailors and damage to the submarine, CORNER BROOK was able to return to Esquimalt under her own power. There she remains, awaiting full repairs that are not expected to be completed until at least . . . 2016. Of the four Upholder-class submarines, only one, HMCS VICTORIA, is operational, although she has yet to be elevated to the fully operational status. This entry was posted in The world's submarines, Video Clip and tagged Canada, HMCS Corner Brook, HMS Ursula, Submarine, video on October 27, 2013 by jasonlockley. HMCS Corner Brook is one of four Victoria-class submarines the navy purchased from Britain. A European company that was paid $1 million to provide equipment for the Canadian navy’s submarines has taken the money and run. The Department of National Defence has been trying since 2009 to get the equipment it paid for from Applied Radar and Sonar Technologies GmbH, a German firm. But the company is no longer registered in Germany and “cannot be contacted,” according to a December 2012 briefing document for senior department staff. The Citizen has tracked the firm to Izmir, a city in Turkey, but company officials did not respond to emails or phone calls seeking comment. The company was supposed to deliver a transportable acoustic range to the Royal Canadian Navy. It was supposedly being built at the company’s facilities in Turkey but officials with Public Works and Government Services Canada couldn’t locate that site. The equipment, designed to support submarine operations, was to have been delivered in 2009. Canada signed a deal with Applied Radar and Sonar Technologies in December 2008 for the transportable acoustic range and paid the firm a little more than $1 million out of the total price-tag of $1.3 million. But according to the DND briefing the firm ran into a series of unspecified problems with the equipment. In June 2012, with the delivery almost three years behind schedule, Public Works requested the company provide evidence as to why the contract should not be terminated. It sent letters to the company’s German office and a Turkish address where the equipment was supposed to be manufactured. But those letters couldn’t be delivered, prompting Public Works to determine that Applied Radar and Sonar Technologies was no longer registered in Germany and there was no record of the firm having a Turkish company. It is now up to DND to try to recover the $1 million. “DND recently received a legal opinion that it can now engage international collections agencies to recover the money the Government of Canada paid to the company,” she added. The company, however, is still trying to sell its sonar products to other customers. “Mobile Accustion (sic) Range is easy to deploy,” the site noted. DND officials could not answer whether the department had properly checked out the credentials of Applied Radar and Sonar Technologies before awarding it the contract. Navies use such systems to monitor and verify the noise and magnetic signature of their ships and submarines. A number of firms produce such equipment and, in the case of the Canadian project, three companies bid. The equipment was to be used on the west coast to support Victoria-class submarine operations. Instead, the Royal Canadian Navy will have to use U.S. military facilities if it wants that capability, according to the DND documents. Canada purchased its submarines second-hand from Britain and took delivery of the boats between 2000 and 2004. The fleet, however, has been plagued with a series of technical problems and incidents over the years. Navy officers say the fleet is now proving its worth while critics say the submarines should be scrapped. This entry was posted in The world's submarines and tagged Canada, DND, GmbH, HMCS Corner Brook on August 26, 2013 by jasonlockley. 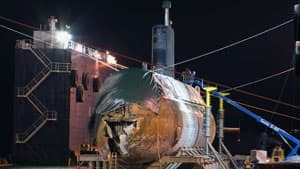 Slamming into the seafloor at 11 km/h damaged one of Canada’s submarines more severely than the navy originally admitted to the public, new documents obtained by CBC show. The Royal Canadian Navy’s Damage Assessment and Options Analysis report for HMCS Corner Brook tells a story of a submarine suffering “extensive damage” from “tearing and dents” that left a gaping, two-metre hole in the submarine’s bow. Seawater was “roiling” in the parts of the submarine and two of its torpedo tube doors had been torn off when it rammed the ocean floor off British Columbia two years ago. The submarine had 60 people aboard, including some of the most experienced and senior submariners in the navy, when it rammed the rocky seafloor while cruising 45 metres below the surface. Two sailors were slightly injured during the June 4, 2011 collision.The navy’s official board of inquiry blamed Lt.-Cmdr. Paul Sutherland, the sub’s captain, for the collision. The inquiry was closed to the public and the navy only released a one-page summary of the hearing. The navy has publicly called the accident a “fender bender” which resulted in no structural damage. But the navy’s internal report tells a much different story. The damage report obtained by CBC under Access to Information was completed three days after the grounding and contains photographs detailing the damage to the Corner Brook. While Vice-Admiral Mark Norman, now commander of the Royal Canadian Navy, assured Canadians the damage was not as bad as it looked, the report says “structural state of sub unk.” Unk is navy shorthand for unknown. “Location of strike likely to have caused shock stress transmission within forward structure,” states the navy’s early damage report. Norman had denied the damaged extended beyond what could be seen in several photographs obtained by CBC in February 2012. The photos showed the submarine after it was hauled from the water with a hole in it the size of a ping-pong table. “The navy has not been upfront with Canadians about the degree of damage and just how close we came to a truly serious accident. I think the Canadian navy has to come clean across the board with respect to Canada’s Victoria class submarines,” said Michael Byers, a University of British Columbia defence expert who has been critical of the submarine program in the past. The report said that there are “strong indications” of damage to the main ballast tank that may extend to the pressure hull of the submarine. The pressure hull is a thick, rolled-steel area of the submarine where sailors live and work. “This accident came very close to claiming the lives of the entire crew,” said Byers, who co-authored a recent report on Canada’s fleet of four second-hand British-built submarines. The damage to the HMCS Corner Brook was in the area in which sailors are quartered. Byers said if the pressure hull is twisted or damaged, it may be impossible for the navy to fix. “Please bear in mind that the documents you have from the ATI request were created very soon after HMCS Corner Brook ran aground in 2011,” wrote Department of National Defence spokeswoman Tracy Poirier in an email to CBC. The navy has said it intends to repair the 2,400-tonne submarine during its scheduled refit period, which is to begin this year and run until 2016. The navy will replace the British torpedo system and other sensors and communications equipment that came with the four Victoria-class submarines Canada bought in 1998. A similar refit process was just completed on another submarine from the class — HMCS Windsor — and it took five years instead of the planned two. The cost of the work on the Windsor totalled $209 million and still only one of the sub’s two generators is operational, limiting the distance the sub can go away from land. 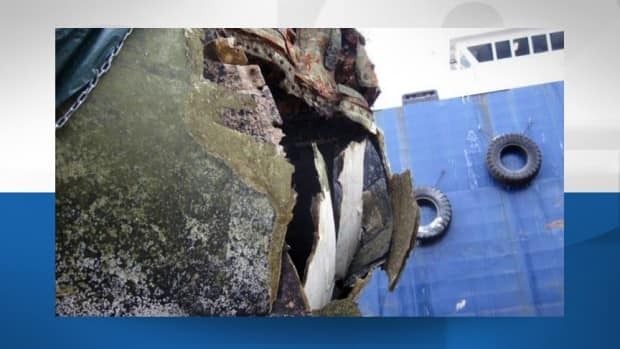 The navy has not said how much more it will cost to attempt to repair the collision damage to the 70-metre-long Corner Brook. “If it turns out not to have worked after an attempt at repairing the vessel then Canadian taxpayers will have poured close a billion dollars into a bottomless pit trying to recover this submarine,” said Byers. This entry was posted in The world's submarines and tagged Canada, HMCS Corner Brook, Submarine on July 17, 2013 by jasonlockley. By the time Canada’s submarines are ready for duty, they’ll be due for retirement. Defence Minister Peter MacKay blames the Liberals for Canada’s troubled fleet of second-hand Victoria-class submarines. It was the Liberals who purchased the four British-made vessels for the suspiciously low price of $750-million in 1998. Yet it was none other than MacKay himself who, 10 years later, persuaded his Conservative colleagues not to scrap them. It was MacKay who signed taxpayers up for another $1.5-billion worth of refits and repairs, thereby throwing good money after bad. It was apparent long before 2008 that the submarines were deeply flawed. The diesel engines were designed for railroad locomotives and not the rapid stops and starts required of submarines. There were defects in the torpedo tubes, making it possible for both the inner and outer doors to be open at the same time, even while the subs were submerged. The subs were mothballed in saltwater for four years before Canada bought them, and years more before we took possession. They suffered serious corrosion — the diving depth of HMCS Windsor is now restricted due to rust damage on the hull. In 2007, Windsor entered a refit that was supposed to take three years but ended up taking six. Documents obtained by the CBC later explained that every system had major problems. Spare parts are also difficult to obtain. It was in this context that MacKay pushed for the $1.5-billion refit and repair contract, a move rendered all the more perplexing by the fact that, by 2008, the submarines were already between 15-19 years old. This meant that the most one could hope for from the vessels, after their refits, was a single decade of service. Which is not very long when you consider that, for the same amount of money, Canada could have procured between 3-4 brand new diesel-electric submarines based on proven designs from France or Germany. Today, five years after the $1.5-billion contract, MacKay insists the situation is improving. Which is true, if going from horrendous to bad counts as an improvement. Corner Brook was damaged in an accident in 2011 and put out of action until 2012. It is scheduled to return to dry dock for three years in 2014. In December 2012, a defect was discovered in one of Windsor’s two diesel engines, which resulted in the submarine having to operate on just one engine. This put the sub on limited duty. She will be taken out of service later this year so that the engine can be replaced. Chicoutimi has been out of the water since the fire in 2004, and will remain in dry dock until at least the end of this year. Victoria, which emerged from six years in dry dock in 2011, is scheduled to return there for three years in 2016. According to the Department of National Defence, Canada’s four Victoria-class submarines have accumulated a total of just 1,131 days at sea in the decade since 2003 — about 30 days per submarine per year. It’s time to stop throwing good money after bad. If Canada wants to maintain this capability, we need to start from scratch. This entry was posted in The world's submarines and tagged Canada, HMCS Chicoutimi, HMCS Corner Brook, HMCS Victoria, HMCS Windsor, Submarine, Victoria class on June 25, 2013 by jasonlockley. The naval submarine HMCS Chicoutimi , shown here in 2009 prior to being hauled to the west coast via the Panama Canal, is undergoing extensive work. Despite a tragic past that saw a Halifax naval officer die in a fire, the Defence Department says a refit in Victoria, B.C., will have the sub ready for operation later this year. OTTAWA — Three of Canada’s four Victoria-class, diesel-electric submarines are to be operational by the end of the year. But there are still questions about whether Canada still has the personnel to handle a submarine fleet, and if the subs are even worth fixing. HMCS Victoria, which has been docked since 2005, was declared operational last year on the West Coast after sinking a decommissioned United States navy ship in a live torpedo test. HMCS Windsor, docked since 2007, has already started live tests in Halifax Harbour. Last November, it completed a live diving exercise in the harbour, known as a camber dive. It made its first run out to sea in December. HMCS Chicoutimi, on which a navy officer died after it caught fire during its 2004 maiden voyage, is also undergoing extensive work. Despite its tragic past, the Defence Department says the refit in Victoria, B.C., will have it ready for operation later this year. With three of the four subs operational, the Defence Department will consider it at a “steady state” of operation. The fourth submarine, HMCS Corner Brook, ran aground in a test last year. It will undergo repairs until 2016. But some analysts say it’s a waste of money to repair the submarines, which were bought second-hand from the British navy for $750 million in 1998. Since they started sailing in 2003, the subs have been at sea for a combined 1,083 days. That means the sticker price alone works out to almost $700,000 per day. “These things aren’t submarines, they’re lemons,” said Steven Staples, president of the Rideau Institute, a defence and foreign policy think-tank in Ottawa. Staples said the submarines will never live up to their billing, which is why the British government originally intended to mothball them. He said the submarines are not needed for defence and are in fact sucking resources from more valuable projects. “The first thing you do when you find yourself in a hole is you stop digging,” he said. The Defence Department says the subs will be used for various activities, including patrols, intelligence gathering and acting as a deterrent. While the vessels might work soon, some wonder if Canada still has the staffing capacity to run three submarines after years of very limited testing ability. In November 2011, Vice-Admiral Paul Maddison, commander of the Royal Canadian Navy, said the number of submariners who are active and ready had fallen to 80 from 300. An internal report in early 2012 raised concerns about the navy’s ability to train enough officers in time. In April, Defence Minister Peter MacKay said the navy had 278 submariners who were working within the program, with 60 more on the way. This entry was posted in The world's submarines and tagged 2400, Canada, HMCS Chicoutimi, HMCS Corner Brook, HMCS Victoria, HMCS Windsor, Upholder on February 2, 2013 by jasonlockley.